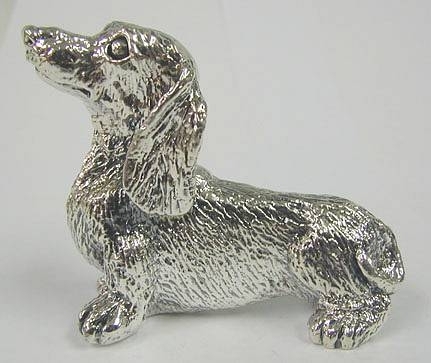 Dachshund Highly sought after by collectors this great dog miniature amazes in beauty, capturing the eye with its adorable gaze. 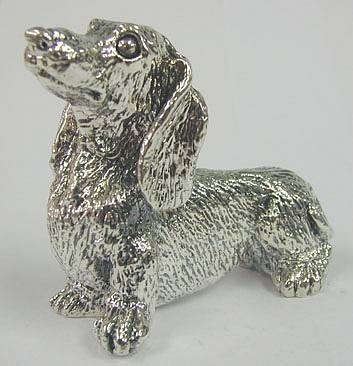 This miniature will hypnotize you with its Dachshund beauty. This figurine was made in the electroforming meth Measurements: Length: 3.6in. / 9.14cm. Width: 1.3in. / 3.3cm. Height: 2.8in. / 7.11cm. Weight: 82.3gr. / 2.64oz. Marks: 925 for sterling silver.